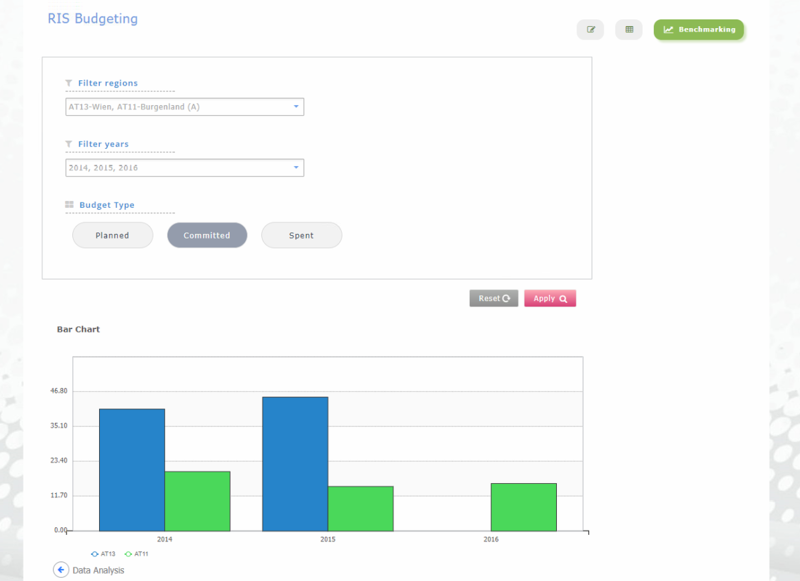 The RIS3 budgeting tool gives the user the possibility to insert and manage budgeting data in a structured way through a web-based dashboard. Filling data into a series of standardised nested tables, the application provides users with an overview of the RIS3 financial plan as well as with customized tables and charts. Selection of the years for the elaboration of the RIS3 Budgeting. Definition of the priorities under which specific measures are grouped. Insertion of data into the standardised nested budget tables in the measure level. Generation of the RIS3 budgeting overview. Selection of grouping variables and application of filters to the data. Export budgeting tables and charts in table or image format. Benchmark your region’s budget with other regions’. Following the application architecture described in previous steps, the information flows within the application are given in Figure 1, below. As the figure illustrates, the initial input comes from the user, who has to define the time period to which the financial plan refers to, as well as the priorities of the RIS3 strategy. Once this information is inserted, the budgeting tables are generated and the user can start inserting more detailed data regarding budget values and other characteristics per measure. 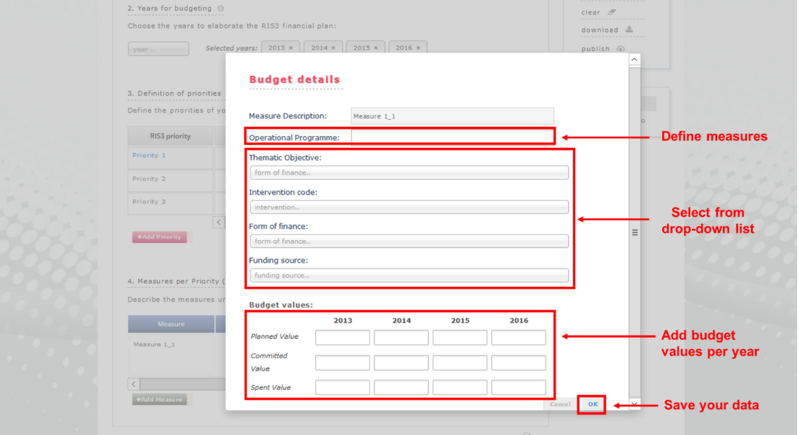 For each priority defined before, a separate table is provided and for each measure users have to provide information regarding (i) the operational programme under which this measure is funded, (ii) the thematic objective, (iii) the intervention field, (iv) the form of finance and (v) the funding source. As far as the budget values are concerned, users are asked to define the amount of money that has been planned to be spent, the committed and the spent one per year. When all the necessary data is uploaded, users can save their progress and proceed to the analysis of these data. Variables can be grouped in several ways and different filters can be adapted so that the users can obtain the form of data they desire. All tables and graphics can be individually extracted through the application in Table and Picture format. Finally, the user can choose whether this data will be published in the database, and continue to the benchmarking process. In this part, users have access to all the published data by other regions and can perform a comparative analysis between different regions. 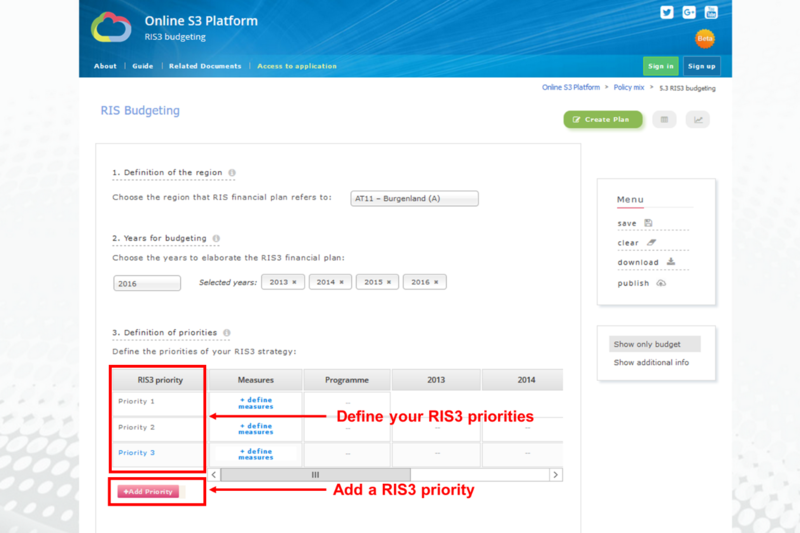 First, you have to select the region for the RIS3 budget you are going to plan. Then, you have to choose the years for which you want to elaborate the RIS3 financial plan. Bear in mind that you should select the years in chronological order, so that the budgeting tables are properly presented. All the selected years will appear on the right, as well as in the budgeting tables, adding extra columns. Bear in mind that you should select the years in chronological order, so that the budgeting tables are properly presented. At any time, you can delete any selected year clicking the x symbol and the corresponding column in the tables will be also deleted. In this step, you should define the priorities of your RIS3 strategy. For each priority you define, a new table will be generated below. Bear in mind that this table is not editable; you have to insert more detailed data in the next step so that this table is informed. 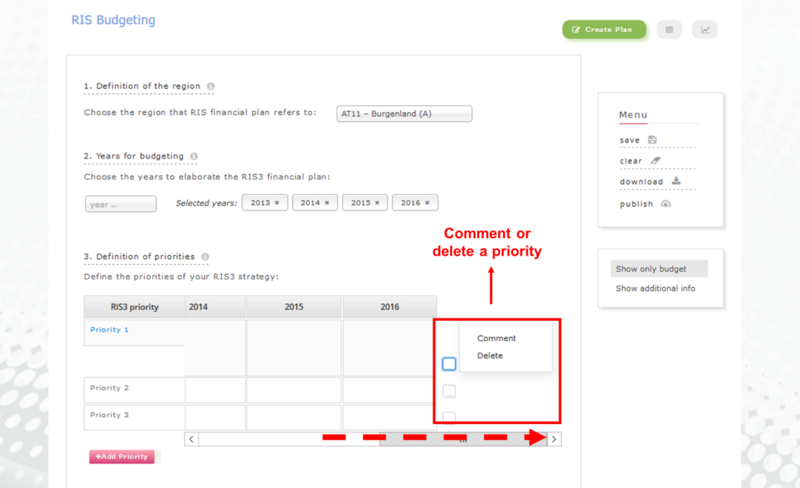 At any time, you can delete or add a comment for each priority, scrolling to the right part of the table. Definition of measures: In order to add more information regarding the measures per priority, click on the “define measures” option and the corresponding table will appear in the bottom part of your screen. A different table of measures corresponds to each priority. Each line of the table corresponds to a different measure and you can add a measure clicking on the “add measure” tab. All the measures you enter directly inform the overall table (in the section 2), but no modifications can be made in this table. 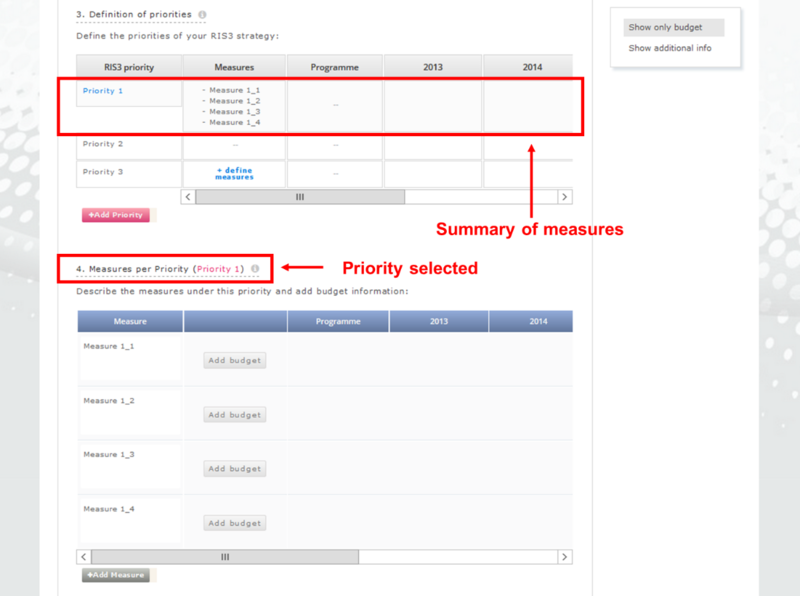 To ensure you edit the right priority table, you can check the priority you have selected as shown in the following figure. Add budget: To add further details regarding each measure, you have to click on the “add budget” option and fill in the required form. You have to provide information regarding (i) the operational programme under which each measure is funded, (ii) the thematic objective, (iii) the intervention field, (iv) the form of finance and (v) the funding source. The budget values should be provided in terms of the planned, committed and spent amount of money. Once you enter all the required information, click the ok button. Note that one measure could have more than one entry for budget, as it might receive funding from different operational programmes, funding sources etc. Whenever it is necessary, you can modify the budget values by selecting the edit icon in the right side of the table, as you can see in the following table. You can also delete the whole measure by selecting the x icon. Save: saves all the data you have entered in your account in the database. Clear: clears all the data you have entered since you started using the application. Download: data is downloaded in an excel file that includes the main table of the overall budgeting and as many additional sheets as the priorities you have defined with the corresponing table. Publish: your data is published in the platform and, in this way, any user can see your budget details. This is a very important step in case you want to benchmark your region with another region. 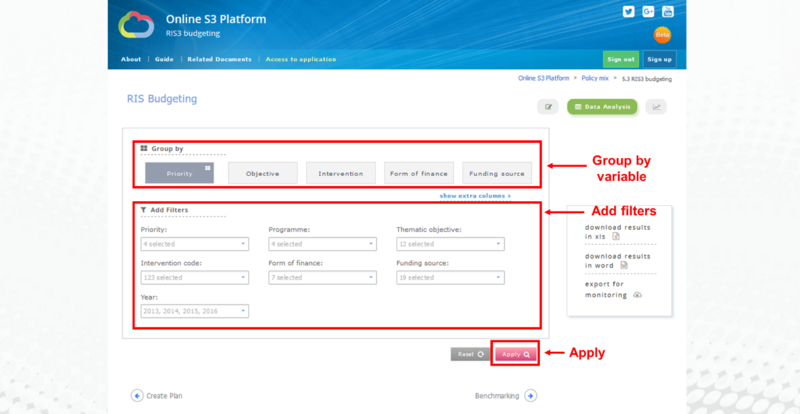 At any time, you can show only budget values or additional information, regarding (i) the thematic objective, (ii) the intervention field, (iii) the form of finance and (iv) the funding source, or even add a comment for each priority. When all the necessary data is uploaded, an overview of your budgeting plan can be found in section 2. This table summarizes all the information you have provided in the priority tables for the selected years. Further don’t forget that at any time, you can show or hide extra columns regarding (i) the thematic objective, (ii) the intervention field, (iii) the form of finance and (iv) the funding source. When all the necessary data is uploaded, you can proceed to the analysis section. You can go to the analysis section by clicking on the data analysis button, either on the upper right part or the bottom right part of the application. Data can be grouped according to any variable and different filters can be adapted so that you can obtain any analysis of your data. You can select whether you want to show or not extra columns in the generated tables and, at any time, you can reset your query through the reset button in the bottom of this page. Clicking the apply button, the table you have selected is generated and your budget is presented based on the selected variable and the filters you have applied. These tables can be exported both in xls and word format, as you can see in the menu at the right sidebar of the application. Moreover, you have the option to export your data in a format that can be easily connected to the 6.1 Monitoring application. However, this feature is not available in beta version. Finally, the user can continue to the last section of this application that is the benchmarking process. In this part, users have access to all the published data by other regions and can perform a comparative analysis between different regions. 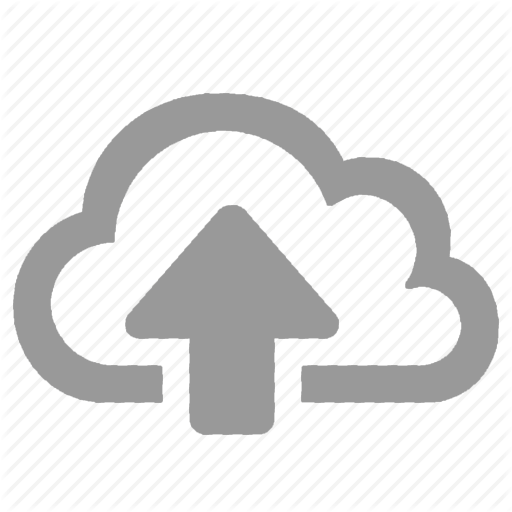 The user is able to export the diagram in an image format (.png) by pressing the Download Image button at the bottom of the graph. 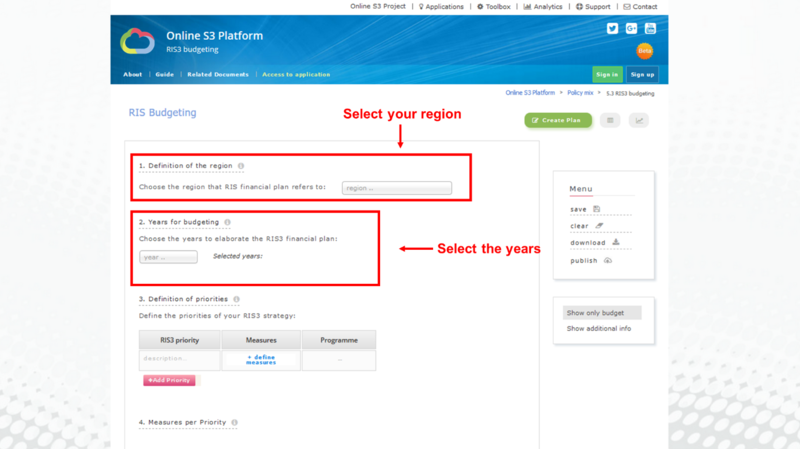 In this section, you have to select the region that RIS financial plan refers to. Initially you have to select the NUTS level (0/1/2) which you want to use for your selection (e.g. NUTS 0 refers to country level). Choose the years for which you want to elaborate the RIS3 financial plan. All the selected years will appear in the budgeting tables below. Note: Select the years in chronological order, so that the budgeting tables are properly presented. 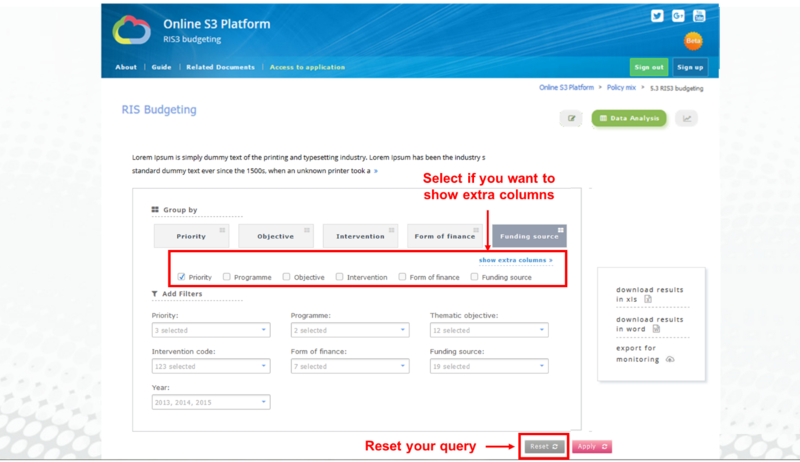 For each priority you create enter a short description and click the ‘define measures’ option. Then, a nested table built up by measures will be generated in the ‘Measure per Priority’ section, where you can enter the financial data regarding this priority. You can also add qualitative data by clicking the more ‘…’ button and selecting ‘comment’. Note: The columns regarding the budget information and the main categories in this table are not editable. They will be updated by the data inserted in the nested table generated. 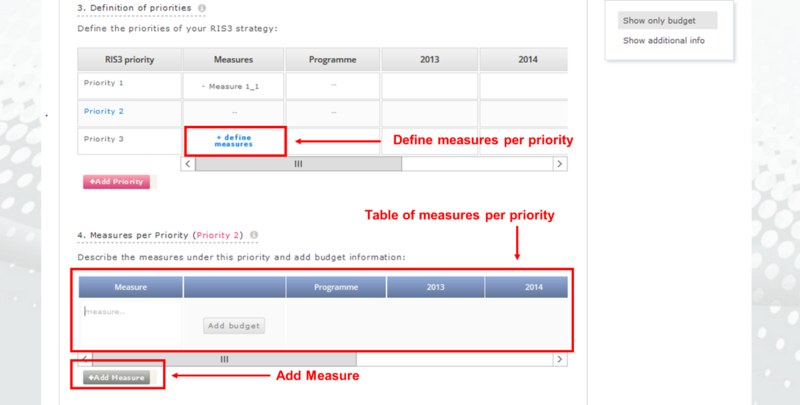 In this step, you can describe the measures under each priority and add budget data. Enter a short description for each measure and click ‘add budget’ button to insert financial data and information regarding the five categories provided. Note: One measure can have more than one entry for budget, as it might receive funding from different operational programmes, funding sources etc. You have to sign in to save the financial plan. You have to sign in to publish the financial plan. You have to sign in to proceed to the analysis step. Sorry, downloading graphs is not supported by Internet Explorer. It is recommended to use a different browser for this functionality.